LEC offers structural engineering services for the renovation or rehabilitation of existing structures. Our registered professional engineers provide structural design documents for a wide variety of projects. Renovation refers to the modification of an existing building. A common renovation is removing interior walls to open up a floor plan. Repair fixes a building after it has suffered damage. 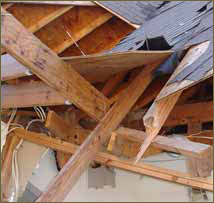 Typically repairs happen after a fire or hurricane. a particular source, such as high winds. This is sometimes called strengthening or hardening. Adaptive re-use is when the structure is modified to support a different function. An example would be an old fire station being turned into a library.